To help young minds discover the joys of engineering and working together as team, while developing STEM skills, leadership skills, and building FTC Robots that can compete and win. Inspiring a mind-set of innovation, collaboration, and sharing. The X-bots are a community based FIRST Tech Challenge (FTC) robotics team dedicated to sharing the wonders of STEM and FIRST. After five years in FLL the X-bots graduated to FTC in 2012. This is our sixth year in FTC. Team consists of three twelfth graders: Edward Tong, Sylesh Suresh and Isiah Turner; one tenth grader: Anoushka Chintada; one tenth grader: Arjun Mangipudi and three ninth graders: Tanisha Pagadala, Anish Malik and Shawn Malik. Since winning the Virginia/DC Division 1 FLL Championships in 2010, we have been FIRST ambassadors and have spread our love of FIRST to the community. We feel that FIRST has taught us many valuable life lessons besides STEM – leadership skills, team work, and Gracious Professionalism and want to bring that to our community and beyond. Hi! My name is Anoushka Chintada. I am an 11th grader at Thomas Jefferson High School for Science and Technology. This is my 7th year of FTC, and I had participated in First Lego League for two years. I was honored to be selected as a Dean’s List Finalist from VA last season and was thrilled to attend the World Championship in Detroit. Some of my hobbies are reading, playing piano and flute, and doing science experiments. I am training in Indian Classical dance and I performed at Kennedy Center with my dance group. In middle school, I created a non-profit to help bring STEM to the community and am an officer on my school’s underwater robotics team. I enjoyed doing Science Olympiad and mentoring other FTC teams. In my house, FTC is a family event, with my brother and both parents coaching. I really love FTC and FIRST as they’ve both helped shape my life in so many ways. My roles in FTC on the team include team lead, leader for Engineering Notebook, driving coach, and builder. FTC is something I look forward to every weekend. It makes me so happy to be able to work and learn so much about real life processes. FTC opens up so many doors and opportunities that I wouldn’t otherwise have. Being on X-Bots has changed me so much. I’ve watched us grow and change, team members come and go, and watched us win and lose, but through it all we’ve always been a team that supports each and every member equally, one that works hard, and one that forever values the things that also matter to me. All the X-BOTS are like a second family to me, and I wouldn’t have it any other way. Hi! My name is Arjun Mangipudi, and I am a sophomore attending Westfield High School. This will be my second year doing FTC and my 5th year with FIRST. I love to run and play various sports. My hobbies include various outdoor activities such as boating, biking, and hiking. I participate in track, Science Olympiad, and Science bowl. My goal for this season is to try and build the best or highest scoring robot there is for this challenge. I like working together with my teammates to build the robot and score the most points we can. I also like the competitiveness of FTC. I like being a part of X-BOTS because I am able to build and do what I love which is something I take as a privilege. Hi! I’m a junior at Thomas Jefferson High School. This is my second year of FTC and I’m excited to learn about everything that goes into making a competition robot. I enjoy designing things and CAD and programming. In my free time, I play video games and play with my dog. I like the freedom that FTC gives you to design a robot that completes the task in any way you see fit. There are more than one ways to solve a problem and it’s fun to see what approaches other teams have come up with. The X-BOTS team is very helpful. Whenever I have a question I can always get an answer because almost all the parents and students have FTC experience. My name is Tanisha Pagadala and I am a 9th grader at Thomas Jefferson High School for Science and Technology. This is my 3rd year in FIRST and FTC. Some of my hobbies include debating on the school debate team, playing tennis, dancing, and playing the violin. This season I hope that we have a lot of successful outreach because it is one of my favorite parts of FTC. In addition, I hope that we are able to build a very successful robot and try to make it to Worlds! I love the fact that we get to work just like engineers and learn in the same ways they do. I also love building robots by ourselves, starting from the very idea of what we build, to the very final robot that we will compete with. Lastly, I always have lots of fun at the competitions, especially since gracious professionalism is so important. I like how X-BOTS works to make sure everyone learns in a very fun, hands-on way. I also like how X-BOTS works to make a better community through outreach. My name is Anish Malik. I am in 9th grade and go to James Madison High School. I have done FLL for 4 years, and this is my second year doing FTC. Some of my hobbies include playing tennis, coding, building, and, of course, video games. I participate in Technology Student Association, Cyber Patriot, and American Computer Science League. My goals for the season are to make friends on the team and build a robot that functions well for the challenge. I like FTC because it is a hands-on learning experience and I am learning a lot. I like that all the team members are really nice and I get to help out in lots of building based tasks. My name is Shawn Malik and I am a 9th grader, currently attending James Madison School. I have had 5 years of experience in FLL, and this is my second year in FTC. Some of my hobbies include playing basketball and doing robotics. When I grow up, I want to be a mechanical engineer. I participate in many activities outside of school. I am in ACSL (American Computer Science League), and also TSA (Technology Student Association), in which I have a leadership position. This year in FTC I hope to expand my knowledge in technology and learn a lot about robotics. I like participating in FTC because it provides me with an opportunity to participate in a friendly competition while allowing me to learn a lot, and gain experience in the robotics field. I like being on team X-BOTS because we are a very diverse team. Unlike most teams, we are not all from one school, rather we are a community-based team, and we come from various different backgrounds, allowing all of us to learn from each other, as we have different strengths. I’m Isaiah Turner, a 12th grader at Thomas Jefferson High School for Science and Technology. This is my first year in FTC, but I’m really excited to be part of the X-BOTS team. This season I hope to use the programming knowledge I have accumulated in order to help my team as best I can. From what I’ve seen, this team will do great at all levels of competition. In my free time, I enjoy playing basketball, reading, and programming. I also compete in CTF competitions, which help me hone my coding skills by providing computer-related challenges involving cryptography, image editing, and other techniques. I like that FTC provides real-world experience in building and programming robots. It teaches problem-solving skills that are vital for a variety of careers in the real world. I like how welcoming everyone on the team has been. Even though it is my first year, my coaches have helped me fully understand the challenge and how I can contribute to the team. I am Sylesh Suresh, a senior at the Thomas Jefferson High School for Science and Technology. I was a part of FIRST for two years in middle school, but I stopped for a while until this year. I enjoy playing the piano and working on coding projects on my own in my free time. I am also the captain of my school’s machine learning club and have went to the state science fair with my machine learning project as part of a team of three. I hope to be able to make it to Worlds this season and help create something I can be proud of. I like being able to write code and see the physical consequences of that code; that is, seeing my ideas come into fruition mechanically instead of them being limited to the computer screen. I like the environment of being a part of a small team whose members are all passionate and interested in technology. Robotics is part of daily life in the family: Nagesh Chintada and Asha Indira have dedicated countless hours and their basement for Robotics, coaching the X-BOTS for over 10 years now. They both have background in Computer Science, Engineering, Product Development, and they enjoy mentoring the youth, teaching them skills to thrive in 21st Century through FTC. 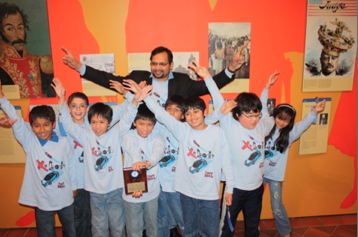 The X-bots after winning the Virginia/DC FLL State Championship in 2010. Went on to represent Virginia at FLL International @Legoland, California. The X-Bots very first tournament ( FLL) in 2009. I am wondering how a child joins the team. I have an eighth grader at Irving Middle School who is interested. Hi Alison, teams usually form /recruit during June through August. There are many local, community teams which usually look to add new members. It really depends on the kid can do and is motivated to do.